If you didn’t know, I love Wonder Woman. As a child, I zipped up my leather boots, grabbed my nylon yellow rope my Dad had in the garage and lassoed trees in the yard. Forcing them to tell me the truth about where to save the woman or man held by the enemy. I had little reference for this superhero other than Linda Carter on TV. Bullets bounced off her bracelets and she could jump to the top of a building so after every show, I’d run outside and see if I could do the same- except for the bullet thing- but I imagined it. I have lived my life, since I was very little running around in under-roo’s, seeking the freedom that truth brings. So… I became a counselor, aiming to help others discover their need for truth as well. Wonder Woman struggles with her identity. She struggles with who she is and what she is here to do. She is always searching for her purpose and living that fully. She struggles with what others expect her to be. Trying to be all things to all people. In this series, she is given the task of being the God of War. Contrasting that is her strength is to love and protect all life. It turns out, this new role practically eats her alive as she is tempted to be something she isn’t. She has to dig deep to be who she truly is- someone who brings peace even when it still instigates war. She sees the best in others. She wants to believe that everyone is good and capable of love as well, and when they aren’t- she can’t comprehend it. But every time, she can’t help but see the good in them. At some point, she can’t trust her own judgement and has to use her lasso. Forged by the gods, it is her only tool for seeing things clearly. Yet, this very same tool humbles her and strips her of her own power. Her desire to love others comes out of her own need for love and acceptance. It is her greatest weaknesses and is often used against her. It haunts her, but she brings purpose out of it by loving others. It turns out… I really AM Wonder Woman. As silly as that may sound to you, it brings me full circle and a sense of completion way down deep in my core. My Father, the God of the Heavens, created me with a purpose. I love others, deeply. I hate to see pain in their eyes. I dig for truth, fight for justice, sacrifice sometimes too much of myself for the sake of others to have freedom from whatever binds them. I know that the truth of scripture is the answer- bringing clarity to confusion, strength to those who need it, and light into the darkest places. I also know that it brings me to my knees every time. Revealing the painful truth of my weakness and insecurity. It reveals that I am not as strong as I think I am. I largely serve others out of my own issues, and that I can wear myself out in the temptation of thinking that I, too, am a god- when I am not and never have been. But I AM in the family of the one TRUE God- and that makes me an heir- able to live in the freedom that Christ died for me to have. 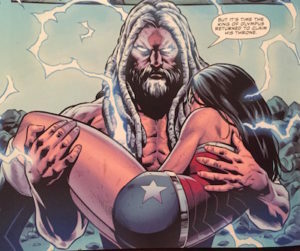 If only I could believe that all the time… but my own issues get in the way, confusion sets in, the lies of the enemy taunt me and I forget for a moment that I have a lasso of truth, the Word, at my side- glowing, ready to be used, ready to shed light, ready to free us all. This is not a spoiler, but this picture showed up towards the end and it is so perfect for where I am in life right now. And I find myself in His arms ready to rest. He has been fighting the worst of the battles for me, but I have been fighting the ones that he has allowed.